i was thinking of getting a rpm gauge for my car but how would you install it into a baja?? They're really quite easy. The hardest part it running a signal wire from the negative side of the coil to the dash. Red goes to key on power. It's pretty easy, really. Just set it to the "4 cyl" setting, run a wire to the coil, cut a hole in the dash, you're good to go. I personally like the Autometer stuff. I've actually never run a tach in my Bajas, they're so loud it's pretty easy to know which gear you should be in. 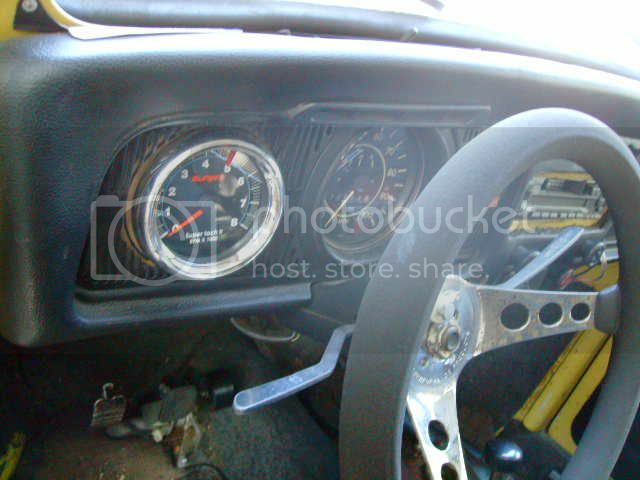 Here is the hot setup for a tach mount. My old circle track car had a old fender blinker I mounted at the very front of my hood centered on the steering wheel. That light was hooked into the idiot lights, this way I could look at the dirt on the track just over the front of the hood and if any thing was wrong the amber fender blinker light would turn on and it's in a place that I can see it very easy.